Forbes published an online article today, titled “Catholic Hospital Mega-Deals Pressure For-Profits Like Tenet and HCA.” There has been a tremendous amount of mergers and acquisition (M&A) announcements and negotiations moving toward consolidation of competing systems. All with the goal in mind to eliminate redundancies, create efficiencies, grow market share and better serve the patient community with value based care. On a smaller scale, this has already proven to be effective, during the last decade. For-Profit, investor owned health systems will be scrambling to create the same competitive edge that the Catholic health systems have a head start on. Forbes writes, “Ascension and Providence St. Joseph Health are reportedly close to a deal that would create a nonprofit health system with nearly 200 hospitals in 27 states. And other Catholic systems are already buying hospitals divested by the for-profit chains.” The announcement last week of negotiations between Chicago based Advocate Health Care and Wisconsin based Aurora Health Care along with California-based Dignity and Colorado-based Catholic Healthcare Initiatives is some of the biggest M&A activity the US healthcare industry has ever seen. Modern Healthcare also published an online article today, entitled “Hospital megamergers may lower overhead, but at what cost?” There are still questions as to how many more efficiencies can be created through the mergers that have not already been created. 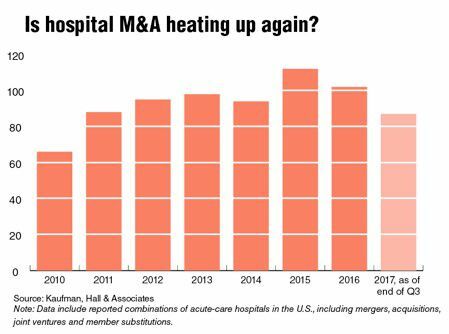 At the end of the third quarter of 2017, hospitals and health systems had struck 87 deals, putting this year's transactions on a path to outpace last year's 102 deals, according to consultancy Kaufman Hall, which tracks provider mergers. Eight deals struck this year were between companies with nearly $1 billion or more in revenue, compared with just four in 2016. Historically, healthcare has managed to “reform itself” while arguments and negotiations continue on Capitol Hill in Washington. It’s no mystery to our nation’s top healthcare executives as to what needs to occur in order to survive. Globally, they have learned from many examples that have been in place for decades. If this holds true in 2018, then it should be an exciting year of change and improvement.